Idle developers of the world take inspiration from this project and unite to create your own version. It’s called the Junkyard Jumbotron because it takes many different displays and allows them to be used as one big interactive display. 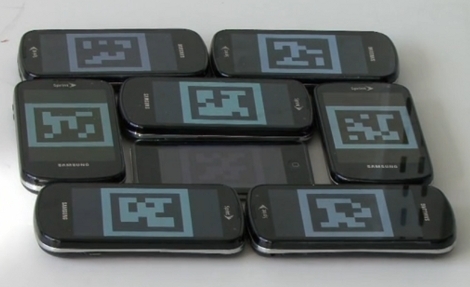 The image above shows a collection of smartphones displaying a test pattern. The pattern is unique for each device and is used to calibrate the display. Using a digital camera, a picture of these test patterns is snapped, then sent to the server. The server calculates the position of each of the screens, then sends the correct slice of a large image back to each phone. It’s funny that they use the word Junkyard in the name of the software. Each display needs to be able to run a web browser so you can’t just use junk displays. But one nice side effect of the hardware requirements is that you can still do things like panning and zooming as seen in the video after the break. Here’s the real question: can you make this work as an open source project? How about something that can be easily set up to work with a LAMP server? [Headsheez] found a way to get his home phone service for free. He’s using a set of tools that we’re familiar with to route service from a typical analog phone system (which involves the extensions wired into your home) through a server to the Internet. On the hardware side of things this starts out with an Analog Telephone Adapter which translates the analog signal for use in a PBX system. 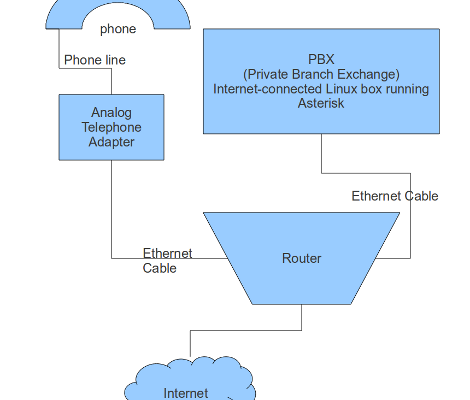 He uses a copy of the open source PBX project called Asterisk which we’ve also seen used on devices like routers and the SheevaPlug. The actual telephone number comes from a Google voice account which for now is a free service but there’s no guarantee that it will remain that way in the future. This should provide seamless service just like you’re used to with a traditional home phone line. There’s even caller ID for the number – but not the name – for incoming calls. The one big feature that is missing from this setup is the ability to call 911 for emergencies. This concept robot uses angular momentum to roll around. You can see that on either end of the robot there are two discs which have been cut on one side to make them off-balance. 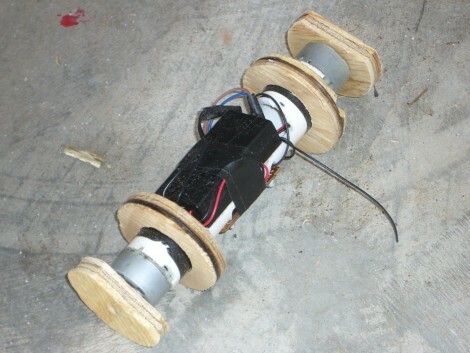 For locomotion, two DC motors spin the outer discs which are not in contact with the floor. This spinning action exerts a force in the opposite direction on the body of the vehicle, causing it to move. It’s not a perfect system and there is one major flaw with using this system. When the forces have equalized acceleration will stop and it will eventually come to a standstill. You can’t just stop spinning the motors because that will act as a braking mechanism. But still, it’s a concept we haven’t seen before and we love the experimentation that’s happening here. Take a look at the test footage after the break and don’t hesitate to let us know if this starts causing light bulbs to flip on above your head. If you are in the market for a nice pair of Hi-Fi headphones, it is not uncommon to to find price tags in the range of $300-$500. [Stacy] loves her music, but she had no desire to pay that high a price for a pair of good portable cans. 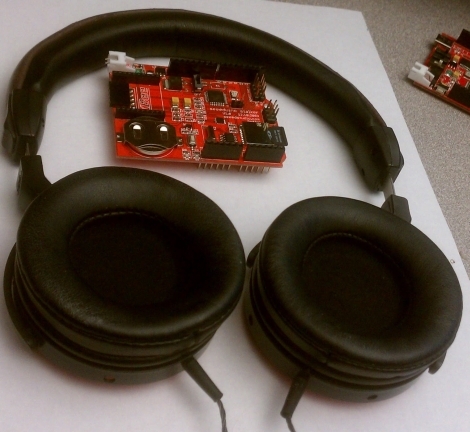 Instead, she upgraded a set of cheap, knock-off headphones to near-audiophile quality for less than $50. She starts off by explaining the technology behind the expensive headphones you see in stores, and why the sound quality is so much better. She says the orthodynamic drivers used in these products produce far better sound due to the placement of the voice coils, and their lack of delay when producing sound. She found a pair of orthodynamic drivers for $30 and fit them into her knock-off headphones with a reasonable amount of effort. A bit of insulation and supporting plastic was added to ensure proper mounting of the drivers, then the headset was painted and reassembled. [Stacy] claims that the end result is easily comparable to far more expensive headsets, especially when connected to a proper amplifier. If you are looking to step up your audio game on the cheap, here’s your chance.